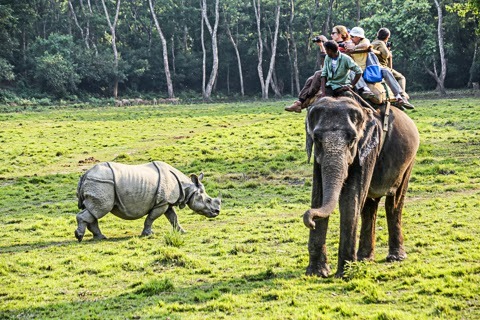 Riding an elephant allows one close access to the rhinos in Chitwan National Park. Photos by Joel Simpson. CHITWAN, south of the Himalayas, is a haven for elephants, rhinos, peacocks and tigers, though we saw no big cats. The local crocodilian is the gharial, and we did see some of them during our morning paddle in dugout pirogues. Owing to their poor eyesight, the rhinos only see the elephant. There is no trouble because they know the giant beat comes in peace, plus the latter is three times their size. We humans are invisible, allowing us to get quite close. 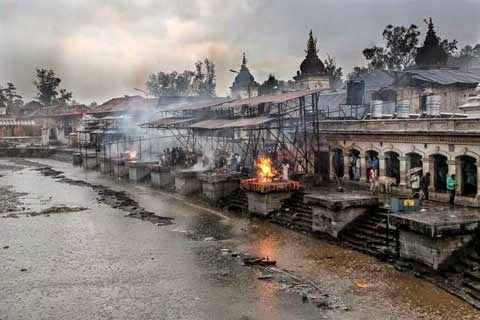 Cremations in progress on a wet afternoon at Pashupatinah Temple. A half-hour cab ride later and I am at Pashupatinath. As I trot down the stone walkway into the temple complex laden with my camera equipment, however, it starts to pour! I have no protection. Suddenly, appearing out of a nearby shop is a young man offering a large, green umbrella. For the next two hours, I hold it in one hand and with the other photograph the smoking funeral pyres along the sacred Bagmati river. It was incredible good fortune, since the rain magnifies the solemnity of the place. 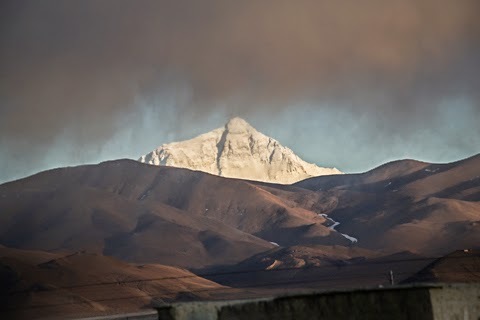 The next day we journey overland for the border with Tibet. The farther we get away from Kathmandu, the poorer the settlements become, though the landscape is breathtakingly mountainous. We finally arrive at the Sino-Nepal Friendship Bridge. I take a photograph very quickly, fearing it is forbidden. It is. After a night in the border town of Zhangmu, much more prosperous than what we have seen in Nepal, we set out for Tingri and quite modest accommodations. However, we have gained significantly in altitude, and I am feeling it. 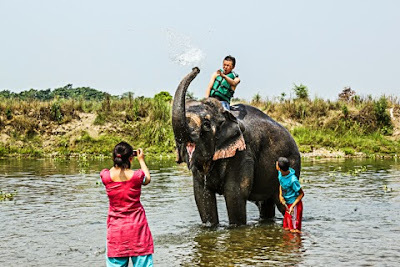 An elephant, at its bath, proves it has a sense of humor by dowsing the tourists who would mount it. On the agenda is a visit to the Everest Base Camp the following day, but I am not up for it. I would be nauseated over the next three days but do manage to visit every monastery and photograph every mountain pass on the agenda. I thought Orthodox churches were ornate, but they are not in the same league as Buddhist monasteries, nunneries and temples. 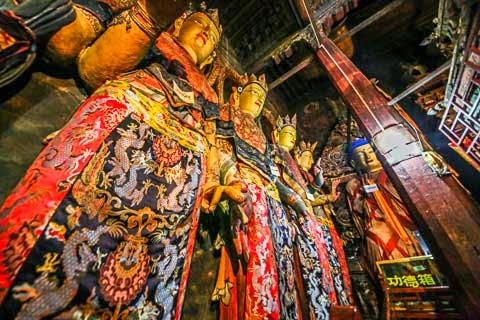 Dominated by immense statues – avatars of the Buddha – they overflow with colorful fabrics, intricate weavings, paintings and elaborate carvings. Illumination comes from circular florescent bulbs and yak butter candles. The guide gives a simplified version of the mythology behind the Buddha effigies, and photography is permitted. Potala Palace sits at a higher altitude than any otherpalace in the world. 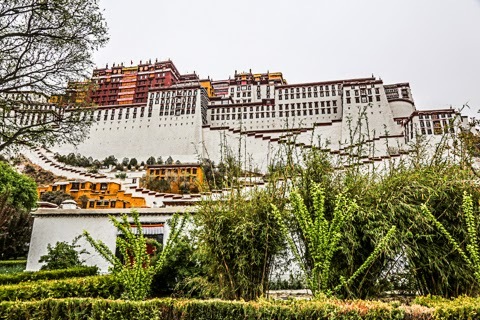 I learn when we arrive at Lhasa, however, that photography is not permitted inside any of the three major holy places we visit: Potala Palace – seat of the Dalai Lama; Sera Monastery, and Jokhang Temple. All are magnificent. We could photograph exteriors, courtyards and roofs, however. Still, I occasionally manage an interior image, with my wide-angle lens shooting from the hip. We stay in the luxurious Lhasa Brahmaputra Grand Hotel, which is a museum unto itself of historical objects. The breakfast buffet is nothing short of incredible. Our first real experience of a lavish Asian breakfast. It is a buffet that includes sausage-like breakfast meats, sliced cheeses, green leafy vegetables, watermelon, egg squares and various small rolls. Lhasa is a surprisingly modern city. A monk about to make a clapping point during debate at the Sera Monastery. Lhasa is a fascinating city, with shops brimming with tourist goods, household items and traditional food (my favorite is the omnipresent yak butter shop). Still, it is a city where one senses the resignation of the local populace, and its demonstrative piety. A man or woman prostrate on a sidewalk will receive a donation from a respectful passerby. I manage to fit in a visit to the Tibet Museum (not to be confused with the one in India). Here, arts and crafts going back centuries is on view, including exquisite historical paintings, jade carvings and silk weavings. 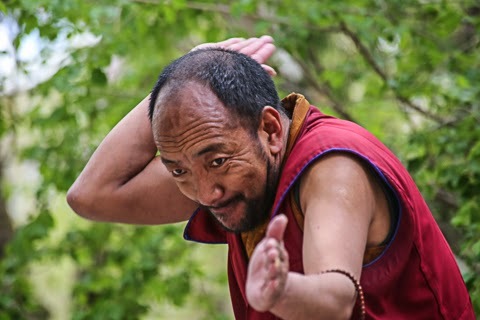 The afternoon brings a visit to the Sera Monastery. The maroon-robed monks who live here famously debate in the courtyard and make their points triumphantly with a loud clap of the hands. Buddha statues inside the Pelkor Chode Monastery on the way to Lhasa. Mount Everest from a distance of 100 kilometers, or about 62 miles.